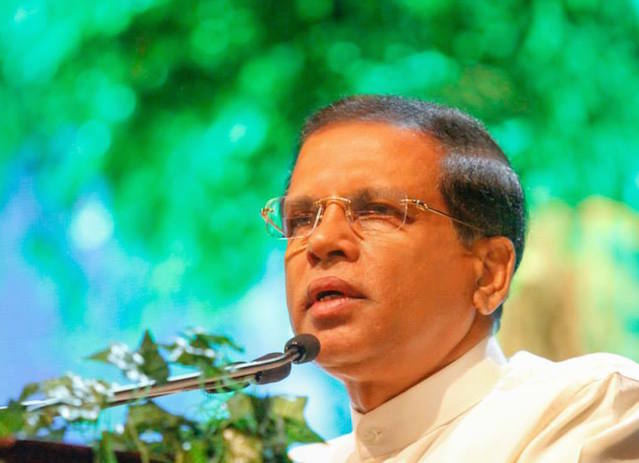 In a fresh effort aimed at consolidating his stronghold within the Sri Lanka Freedom Party (SLFP), President Maithripala Sirisena in his capacity as chairman of the SLFP appointed new organisers to electorates and six districts today. Incidentally, none of the loyalists of former President Mahinda Rajapaksa was included in the new appointments. Accordingly, Sujeewa Chandrasiri was appointed as the organiser for Colombo district, while Anju Sri Shyam Perera was appointed to Gampaha, and Asanka Ediriweera was appointed as Kalutara district organiser. Channa Saliya Mendis and Thissara Gunasinghe were appointed as Galle district organisers, while Pasanda Yapa Abeywardena and Nalin Ranaweera were appointed as organisers for the Matara district. Sri lankan elections are useless. It is not the voters who decide losers. It is the yahapalane. A different kind of fraud making voters humiliated. This can help in marginalizing WILD Meeharaka in the months to come. No matter what anyone bothered, he did not care least – not listening ot anyone, he managed to handle two terms – has paved his own grab to this day. But MY3 seems to be well thoughtful – person – I really like his gentleness – no matter he cant speak foreign langauges – but his knowledge in lanken politics is the best. Whoever whatever being said and done – MY3 is unique in his actions- he has already shown good example to the entire world. Anyways, SLPFrs of good kind can do the job well. At least now to go for this move can help the party a lot. UNP will rout these clowns. And I will be very happy. Sirisena owes it first to CBK and then to MR for where he is now. Good guy perhaps but having to look over his shoulder all the time because of the Rajapakse mafia. But on the other hand, MR and GR are still very popular in the SLFP. UNP will rule for 20 years because SLFP will implode. Fine. I’m supportive of the effort, and accept that my thinking cannot possibly encompass all the considerations that have to go in to this. But really, are going to be stuck for ever with the likes of S. B. Dissanayake? Some of us have sufficient faith in Matthri to accept such seemingly questionable moves, but will it work when people who for no valid reason could not get endorsement from the people in August 2015 are included? Sarath Fonseka and his party not getting votes can be explained in terms of SLFP and UNP supporters not wanting to jeopardise the movement to torpedo the Rajapaksas; I’m no political commentator, but seeing some of these names causes misgivings. We don’t need a new political party from MR, but a decent think tank. We can only be successful through a good strategy. Some people are happy to see MR in the current situation. Please do not rejoice when your fellow countrymen fall. If you do, it will show your humanity and professionalism. It does not matter who fell, whether the LTTE or the Rajapaksas. They are human beings, and our fellow countrymen. When I was in Australia I tried my best to guide the LTTE and the Tamil leaders, in order to save Tamil People and defense forces, but the LTTE’s leadership and the Tamil leaders didn’t listen to me. Between 2010-2012 I also tried my best to guide MR through Sri Lankan High Commission in Ottawa when I was in Canada. But the Rajapaksas didn’t listen to me either. I even wrote to the Chinese leaders through the Chinese Embassy in Wellington when I was in New Zealand. I emphasized to the Chinese leaders how important to guide MR, but nothing happened. The West has done a tremendous job to isolate me. The West makes sure that Asians won’t have access to knowledge. Tamils and Sinhalese couldn’t use my knowledge, because they listen to people who are approved by the West. I don’t think the current government can benefit from my knowledge either. This has to change. Therefore, we need a meaningful ‘Think Tank’ to guide Sri Lankans, especially Tamils. The failure of the LTTE and the Rajapaksas are clear evidence that we need to create a meaningful and effective think tank for Sri Lankans. If we continue to listen to foreign approved leaders we will continue to betray our people. Whether its My3’s men in and MR’s men out or the other way round, they will continue to rob and cheat to the very end. They are all a bunch of robbers in nice clothing. Its only something similar to the French Revolution that will bring about a clean and uncorrupt Sri lanka and till that happens we will see old wine displayed in new bottles. Wonder what he is going to call it?.. Money shouldn’t be a problem..
Will the Elite, Anglicans , Vellalas and the Wahabis vote for them ?….. I was looking for you in the above photograph. Then it struck me that MR is absent from it. Therefore, your absence is understandable. KASmaalam is where MR is. Do you know who carries MR’s b***s when you are away and swinging at the Golf Club? Bodhi Sira has his own Party..
Wonder what he is going to call it !!!! Will the Elite, Anglicans, Vellalas and the Wahabis vote for them ?.. No one appointed for the districts in the NE? So what does all this reshuffling bring to the people of Sri Lanka. I assure you – nothing. The average man is not going to benefit even the slightest bit by all this Machiavellian manipulations. While these politicians are fervently engaged in their favourite parlour games of winners and losers, the ignored country will continue to bleed. THE LOFTY NAMES AODRNING THE PARTY ORGANISERS AS GIVEN WIDER PUBLICITY, WILL HAVE ABSOLUTELY NO USEFUL PROFITABLE IMPACT ON THE MASSES WHO ARE THE REAL DECISION MAKERS.THESE MEN AND WOMEN WLL PLEASE THE PRESIDENT AS IS EXPECTED. AND NOT THE VOTERS, WHO ARE THE TRUE GODS.AS LONG AS THEY ARE EVIDENTLY RECEEDING FROM TH SINHALA/BUDDHIST PEOPLE PROGRESSIVELY AND VERY EVIDENTLY. UNLESS SOME EFFECTIVE NOT WEAK AND EFFIMINATE, WARNING MESSAGE IS GIVEN TO TH EX LTTE TERRORIST RUMPS, AGAINST THE DISPARAGING BELITTLING MANNER WITH WHICHTHE MAJOR COMMUNITY AND THEIR RELIGION IS CONDEMNED WITH NO CONCERN WHATSOEEVER,TREATING US A 3RD CLASS CITIZENS. RANIL/CHANDRIKA DUO IS CEATING AN IRREPERABLE LOSS AND DAMAGE TO US.OK SINALAYA MODAYAWIL TEACH A LESSONS TO THOSE CONCERNED. [Edited out], BUT PRESENTLY WE NEED STRONG TRUE BUDDHIST SINHALA TO TAKE THE VANGUARD, NEVER MTTER IF IT IS EEN PRABAKARANA.